The Amish community typically supports Republicans. Will they go for Trump? 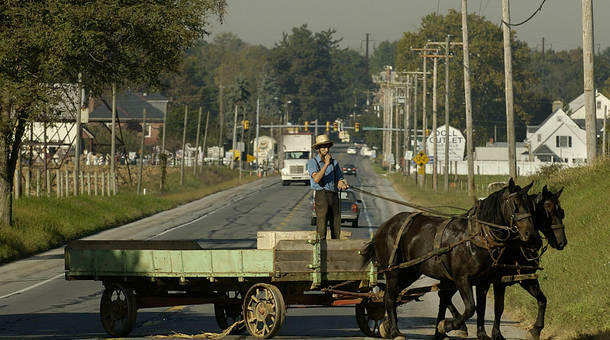 An Amish farmer steers a horse-drawn cart near the town of Bird-in-Hand, Pennsylvania. A super PAC with an allegiance to Donald Trump has been courting Pennsylvania's Amish community. The Amish, who embrace simple living and reject modern conveniences, have historically been supportive of Republicans. But Trump isn't a conventional Republican nominee, said the Economist Magazine's Rosemarie Ward. Ward was recently in Amish Country near Lancaster, Pennsylvania. She joined us to talk about the group's political leanings and how they might perceive Trump. It's a super PAC founded by some Ben Carson fans who needed a new hero. And they looked to Trump. The two original founders [Ben Walters and Ben King] both had roots in the Amish community. The only Democrat I could find that they liked was Williams Jennings Bryan, back in 1896, because he was very pro-farming. So for over a century, they've been fans of Republicans. Yet Trump isn't the typical Republican as we all know. But he is pro-small government, which they like. He's for fewer taxes, which they also like. And he says he will help the farmers when he's elected. It's not clear how much they know about the Trump that we know, because they don't have access to television or the internet. Democrats are just as alien to them as a twice-divorced, several-times bankrupt politician. They do [have access to newspapers]. But I think most of what we see of Donald Trump we see on social media, which they do not have access to.